On Wednesday, The Stronach Group (TSG) unveiled the concept of the Pegasus World Cup (PWC), a $12-million race–billed as the world’s richest–to be run Jan. 28, 2017, at Gulfstream Park. The 1 1/8-mile dirt event will be funded by the sale of 12 individual $1-million ownership “shares” that entitle any horse (not just a specific nominee) to a spot in the starting gate. The shareholder is free to lease, contract or otherwise sell the privilege to start in the race, and will be further entitled to share equally in 100% of the net income from PWC handle, media rights, and sponsorships. On Thursday morning, Frank Stronach, the founder and honorary chairman of TSG, granted a brief phone interview to TDN‘s T.D. Thornton to follow up on some key points about the PWC. An edited transcript follows. TDN: You’re in both the business of running racetracks and breeding/racing horses. How much of this idea is based on wanting to try something new versus recognizing that the industry is in need of a paradigm shift of the way we put on the show? TDN: For the past decade or so, racetracks have been paying exorbitant appearance fees and bonuses to attract marquee horses. Does the PWC signal a fundamental shift, so that owners of star horses might be expected to commit money up front in order to cash in on a potentially bigger payday on the back end? FS: No, no. I think the basic idea was, we will set up a corporation and incorporate it as 12 shares. And for a million bucks you can buy a share. And if you haven’t got the right horse, you can make an arrangement. You can lease the spot [in the starting gate] to somebody, or do a joint venture, or split the purse with another owner. There’s a wide variety as to what you could do. TDN: Do you anticipate selling out all 12 PWC shares? Are there contingency plans for under subscriptions? FS: Under subscriptions are not a problem. In the case that not all the shares are sold, we just will pick them up. There will be 12 horses in the starting gate, no question. 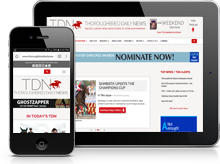 TDN: How about over subscriptions? Do you envision there could be a secondary market created in which owners who bought shares early will sell them for a profit as the race approaches? FS: I’m quite sure that in some cases, that will happen. TDN: At what point is the $1 million due? FS: I think the timetable is about towards the end of June or early July. TDN: Explain the rationale for scheduling the race at Gulfstream in January. FS: First of all, we do not want to conflict with the Breeders’ Cup, because they’re putting on a great show. And we do not want to conflict with the G1 Dubai World Cup. I think those are great programs, and we didn’t want to interfere. That’s why we picked the [January] time. It’s a quiet time in racing. And if you have a great horse that could be a stallion, there’s still plenty of time [to both run in the PWC and retire the horse to stud] for that particular breeding year. TDN: How about concerns about conflicting with TSG’s own traditional winter Grade I stakes races for older dirt horses, like the Donn H. or Santa Anita H.? FS: They go on. That’s not a problem. TDN: This is clearly an out-of-the-box concept. Are there some out-of-the-box revenue-generating ideas that might be tapped to go with it? FS: The revenue stream goes 100% to the shareholders. I don’t think there’s a huge risk. I think hopefully the race will get very popular, that it will be, to a great extent, self-funding. The media rights, the betting handle, the marketing rights… It’s the richest race in the world, so it should attract a lot of attention. We do hope that the television broadcasting companies will want to participate in that. TDN: What sort of feedback have you gotten from owners and horsemen? FS: I spoke to a lot of owners, over the last few months I bounced some of the ideas off them. Management has a whole flood of people being interested with questions and answers. The people which will subscribe to the shares will have an automatic right to participate in the future [runnings] of this race. TDN: At some point you must have run “for instance” numbers to give potential share buyers an idea of what type of returns they might expect. Can you discuss some ballpark financial expectations? FS: We have some ideas. But I hope and I think that the race will get a lot of attention, that a lot of horsemen will participate in it. TDN: Do you see the aggregate amount of profit that owners will share from this concept as being a greater amount of money than what a racetrack would expect to generate from paying for and marketing a $12 million race by itself? FS: No, no. The entry fee is high, but, on the other hand, the owners get back all the income from this race. TDN: What are your expectations for global support? FS: We do hope that we get some horses from South America, from Europe, from Asia. TDN: Will there be ability-based eligibility requirements to make sure those 12 PWC starting gate spots go to the world’s most accomplished horses? FS: No. That’s the beauty about it, right? Because there are only 12 spots, if you own a share, you could make any deal. I think the key question is anybody participating would have to be able to be licensed. TDN: If the profit-sharing concept works with a race of this magnitude, could the concept be scalable? By that I mean could you see profit-sharing trickling down as a way of funding other types of races or even entire racing programs or race meets? FS: That’s possible. But smaller races are less interesting, right? TDN: What is your long-term vision for the PWC? If we were to have a conversation five years from now about it, what would you expect we would be talking about? FS: We hope that the race could carry on for a long, long time or forever.